Welcome to Dane Holdings Tax Service, we have over 20 years of expertise. Did you know that there are people out there right now impersonating the IRS trying to get your social security number? We’ve listed the newest IRS Scams and the ways to avoid them. 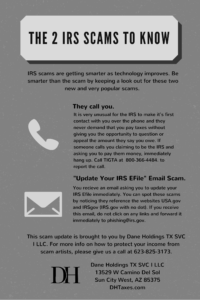 Print it for your self here: IRS Scams. We provide expert tax advice to both individuals and businesses. With over 20 years of experience we’ll ensure that you’re always getting the best guidance from the most professional and friendly company in the industry. Download a Tax Organizer for 2017 to keep all of your tax info in line!